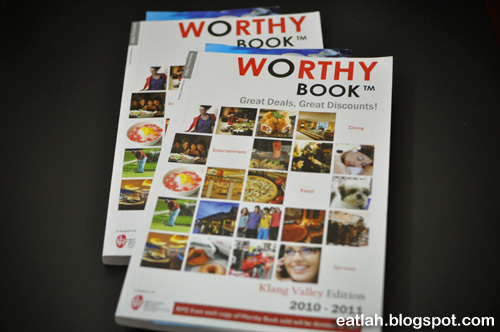 Worthy Book 2010 - 2011 | where and what to eat lah? 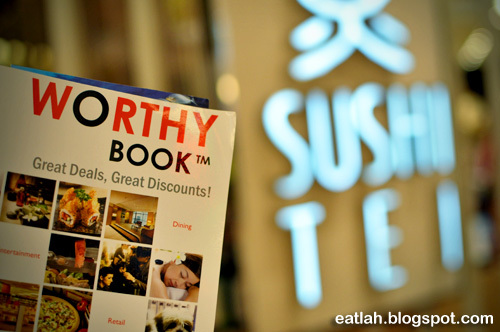 Worthy Book is a compilation of discount vouchers worth up to RM 18,000 from various participating merchants ranging from Dining, Entertainment, Retail and Services mainly within Klang Valley. Price for only RM 35 plus an extra 30% off (RM 24.50) just for our readers and in return, you'll get to enjoy RM 18,000 worth of vouchers - isn't it worthy enough?! If you love Japanese food as much as I do, Worthy Book is the book to have. 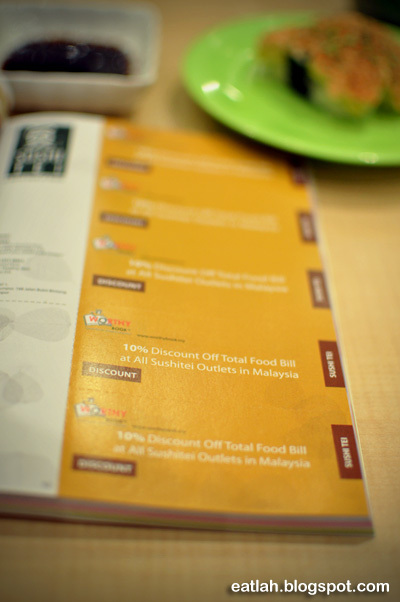 They have vouchers for Ichiban Boshi, Sushi Zanmai, Sakae Sushi, Kuriya and Sushi Tei. While others that are worth mentioning are Tony Roma's, Kenny Rogers, Wendy's, Boost, Krispy Kreme, Papa John's, Lecka Lecka, Modesto's and many more! I have Sushi Tei like almost every week and spend average of RM 50 - 70 each time. There are like 5 pieces of 10% discount vouchers for Sushi Tei and that gives back my return of investment (ROI) easily. Moreover, you can claim it for tax relief too; after-all, it's a book!? Whether you're a food lover, travel junkie, party goer, shopaholic, or someone that enjoys pampering spa and manicure services, there will be a section suitable for you. Too many worthy vouchers to cover here but you can refer to the online version of the book at http://www.worthybook.my/. LIKE Worthy Book's Facebook page. SHARE this post to your Facebook with your MOST CREATIVE answer to the question, What is Worthy to you? EMAIL me at russel.loh[at]gmail.com your details such as your Name and Facebook Name for verification. If you missed your chance of winning it, you still can buy it at 30% discount off the retail price by quoting "eatlah". To get hold of Worthy Book, you can either email them at info@worthybook.my or call them directly at 03-2264 3115. Unfortunately, you can't find Worthy Book in any major bookstores in Malaysia yet. Congrats to Sherin and Michelle! Both of you are the chosen lucky winners for the Worthy Book! For those that didn't win it, fret not! You'll still get your 30% off by quoting 'eatlah' whenever you purchase one. Do you mean, me? Michelle Teng? Have you necessary some coinage, chwilówki d24 although solely don’t contain it until pay day? It all will happen co jest kredyt chwilówka for you to countless Us citizens across the country day-to-day. An issue comes up and you simply need to have pożyczki pozabankowe gorlice some dough, your check isn’t lodged still. Only if pożyczki pozabankowe there would be ways to zarekomendował mi ją obtain an online payday loan on the net, right?